Eczema can occur any time of the year, but the winter season can lead to eczema flare-ups and cause a lot of problems. Eczema, or atopic dermatitis, is a chronic skin disease. If you have eczema, you may have to deal with symptoms like severe itching (especially at night), dry and scaly skin patches that are red to brownish-gray in color, and small raised bumps that may leak fluid and scab over if scratched. These symptoms tend to get worse in the winter. The problem can affect different body parts, including behind the knees and inner elbows or forearms, as well as the face, neck, wrists, scalp, arms, legs, chest, and back. Dry winter air combined with indoor heating systems can really dry out your skin and trigger an increase in eczema symptoms. Other causes include wearing too many layers of clothing, taking hot baths or using too many bed coverings. Eczema may also be caused by skin irritants, infections, stress and exposure to certain allergens, such as dust or pet dander. As temperatures drop, many people search for ways to treat eczema and deal with the dry, itchy skin and irritating rashes. Fortunately, there are many simple remedies and lifestyle changes that can help you alleviate eczema flare-ups and enjoy the winter season to the fullest. 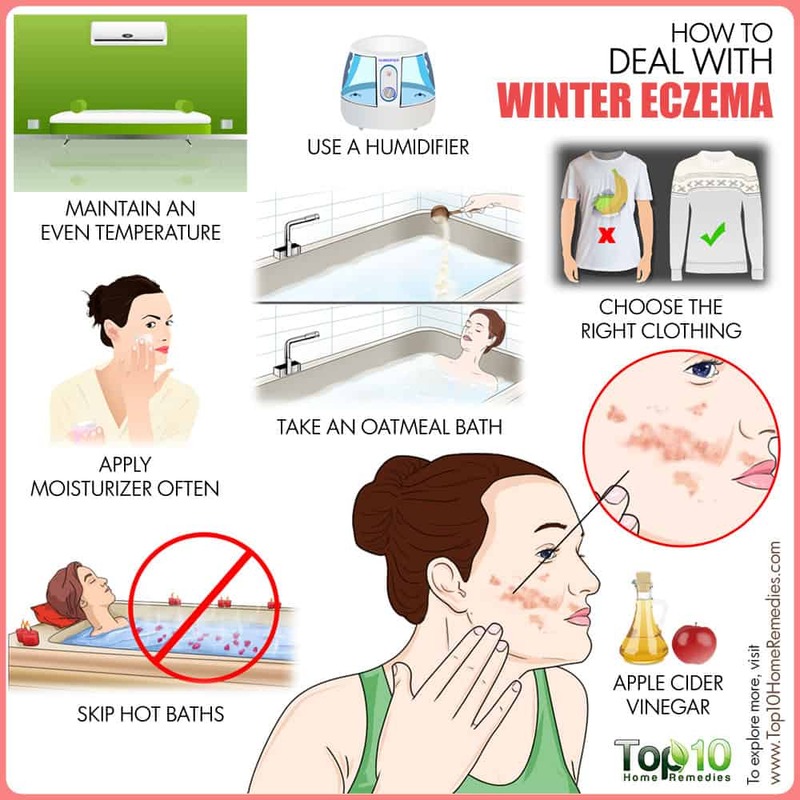 Here are the top 10 ways to deal with winter eczema. Skin tends to react to sudden changes in temperature, especially during the winter. For instance, when you enter a warm house on a cold winter’s day or vice versa, the skin is not able to handle it properly. In fact, the sudden temperature change contributes to dry skin and itchy sensations. 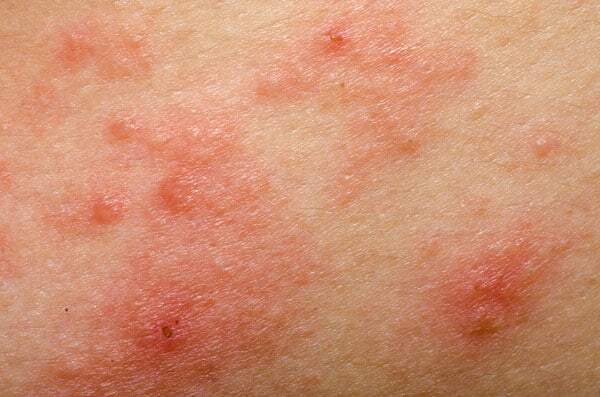 This can worsen eczema symptoms. Maintaining an even skin temperature as much as possible can be very helpful. 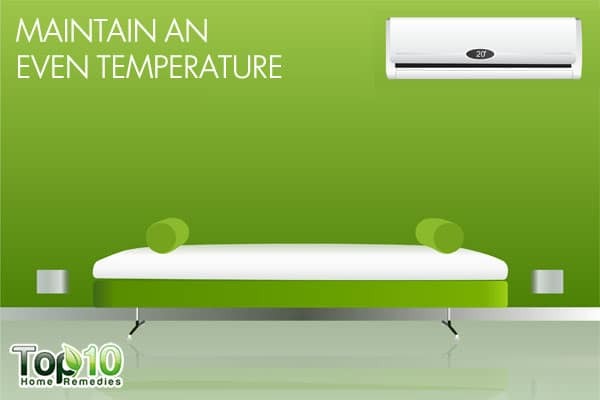 Keep each room at a constant, comfortable temperature. Instead of using one thick duvet, use layers of bed coverings so that you can remove them one by one depending on how warm you feel. The same concept applies to your clothing. 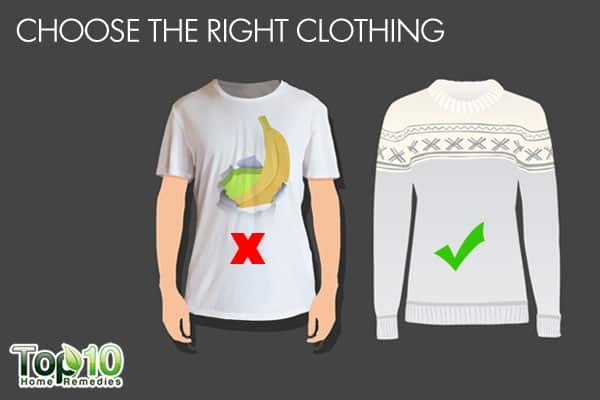 Wearing layers allows you to remove pieces of clothing as needed to prevent your body and skin from overheating. Humidity tends to remain low in the winter. As the temperature drops so does the humidity in the air. Moreover, central heating systems force hot air throughout the home, which in turn dries out the indoor air and can lead to eczema flare-ups. You should keep your house at a comfortable temperature that is not too warm or too cold, with a humidity level between 45 and 55 percent to stop your skin from drying out. If the humidity in your home is too low, use a humidifier to help add moisture back into the air. 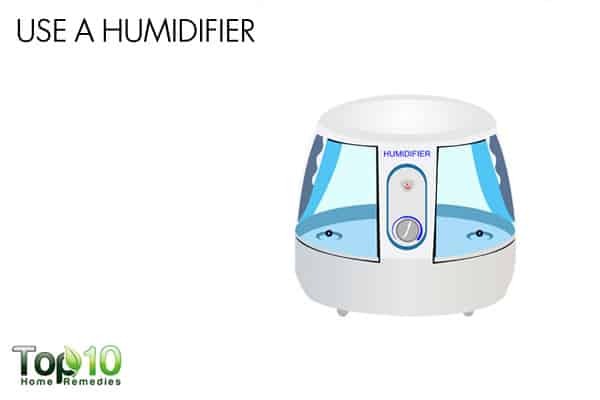 You can buy a humidifier or simply keep a bowl of water in each room to help increase the moisture in the air. No matter what you decide to use, keep it clean to prevent mold growth. Moisturizers are essential any time of year. But in the winter, you need to use a thick one and apply it more frequently. Using the right moisturizer is one of the best ways to deal with eczema flare-ups. Get a heavy-duty moisturizer, particularly an ointment rather than cream, to use in the winter months. Another option you can try is almond oil, which is thick and helps keep your skin moisturized for hours. When using a moisturizer, pay extra attention to your hands and face, as they are most often exposed to the dry and cold air. It is best to apply moisturizers and oils when your skin is still wet after a bath or shower to seal in the moisture. Make sure to moisturize your skin more than once per day. As the temperature drops, we tend to cover ourselves in layers of clothing. Hats, scarves, gloves, sweaters, and socks are essential to protect yourself from the cold. But those who suffer from eczema should avoid items made from wool. Wool can make the skin dry, which can increase itchiness. Also, anything that has rough seams and loose threads can have the same effect. Try wearing several layers of cotton clothing rather than one heavy layer of wool clothing to help you adjust your body temperature as needed throughout the day. Those allergic to chromate should also avoid leather gloves and hats. If you have leather or wool gloves, you can wear a pair of silk gloves underneath them to reduce skin irritation. Another important point is that you must remove wet clothes and shoes immediately as they can irritate your skin and worsen your symptoms. 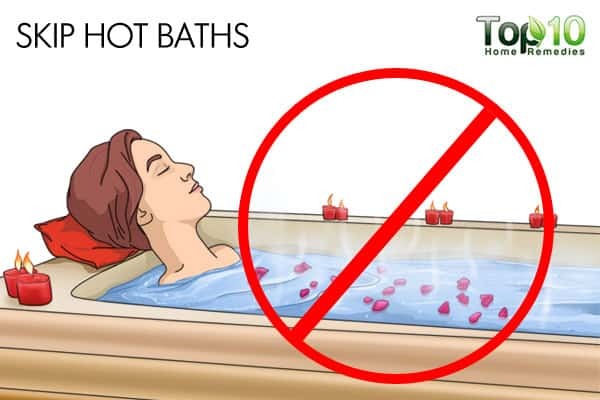 No matter how tempting it feels to take long, hot baths during the winter days, you must not do it. In fact, hot baths can be the reason behind winter eczema flare-ups. The heat from hot baths can cause your skin to dry out, which leads to dryness and itchiness. Instead, use warm water, and take baths or showers less frequently and limit the time as well. To help your skin retain moisture while bathing, you can add some moisturizing products to the water. At any cost, avoid harsh soaps, as they will strip the natural oils from your skin, making it more vulnerable to drying out and exacerbating your eczema. After taking a short bath or shower, don’t rub your skin with a towel. Pat yourself dry instead, then rub some olive or almond oil into your skin while you are still wet. 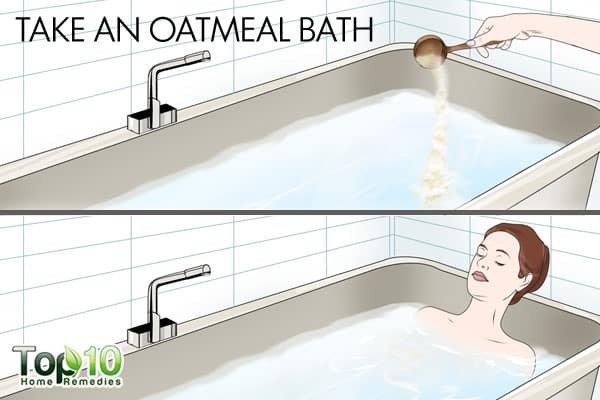 Taking an oatmeal bath can be enjoyable on a cold winter day, and it may help reduce itching and soothe your skin. It also helps combat dryness by removing dead skin cells and prevents water loss so your skin stays moisturized. It’s best to use colloidal oatmeal, which contains anti-irritating, anti-inflammatory and soothing properties that ease itchiness and reduce pain. Draw a warm bath and sprinkle 1 cup of colloidal oatmeal into the water. Soak your body in this water for 15 minutes. 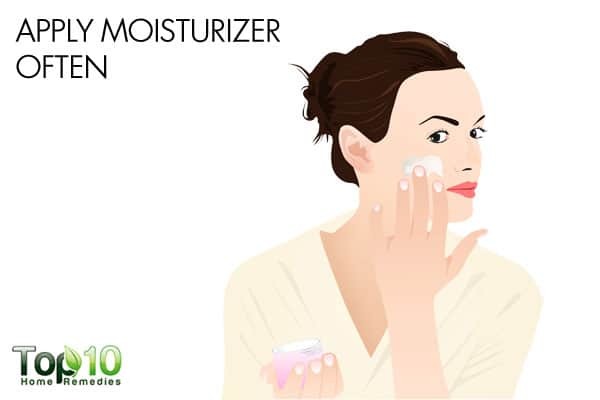 Apply moisturizer to your wet skin to help seal the moisture into your skin. Enjoy this soothing bath once or twice a week. During the winter months, the sun may feel soothing to the skin. But just because the temperature is low, it does not mean that you can skip the sunscreen. Even on a cloudy day, if you are outside for long periods of time, you can get sunburned. This, in turn, can worsen the symptoms of eczema. 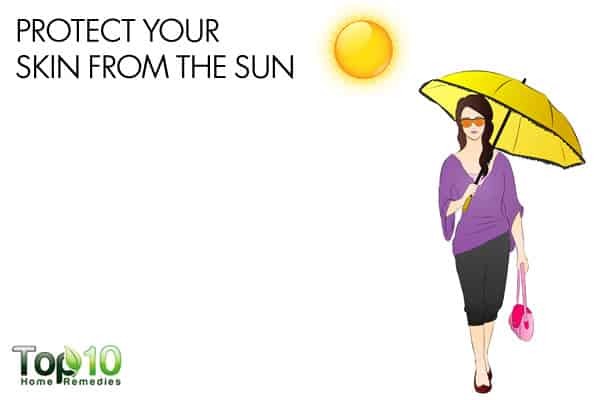 So, before you head outside, protect your skin with a broad-spectrum sunscreen with an SPF of 30 or higher. When choosing a sunscreen, check for any ingredients that your skin may be sensitive to or may cause irritation. Also, remember that a little sunlight is essential for the production of vitamin D in the body, which is also important for your skin and immunity. If getting out in the sun is not possible, consult your doctor about taking vitamin D supplements to improve eczema flare-ups. Apple cider vinegar can be used internally or externally for eczema relief. It helps balance the skin’s pH level. It also contains astringent, antifungal and antibacterial properties that can reduce eczema as well as eczema scars. Plus, it helps the body get rid of toxins, which is important for healthy skin. 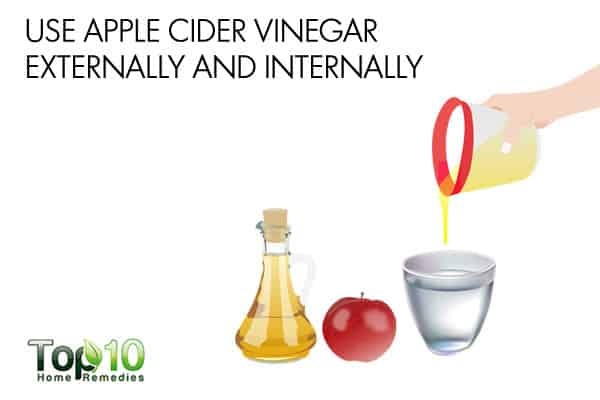 Mix equal quantities of raw, unfiltered apple cider vinegar and water. Apply it to the area affected by eczema and allow it to air-dry. Then, rinse it off with lukewarm water, pat dry your skin and apply a thick moisturizer. Do it twice daily. Also, mix 2 teaspoons each of raw, unfiltered apple cider vinegar and raw honey in a glass of water and drink it twice a day. To manage dry winter skin and eczema, make sure you eat a healthy and nutritious diet. You must include foods high in omega-3 fatty acids, such as salmon, fish oil, and flaxseeds. These healthy fatty acids can help your skin retain moisture and stay hydrated. Also, protein and foods rich in vitamins E and C are good for your skin. Use extra-virgin olive or coconut oil for cooking. Fermented foods like kefir and yogurt can also be helpful. Certain herbs like chamomile, turmeric, plantain, calendula, comfrey, and burdock are helpful for eczema. 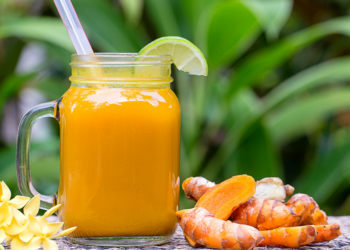 Avoid citrus foods and homogenized milk products, which can worsen your symptoms. Also, keep processed foods, white flour, sugar, and artificial sugars and ingredients to a minimum. Keeping your body hydrated from within helps keep your skin hydrated. This, in turn, will help prevent eczema flare-ups during the winter months. 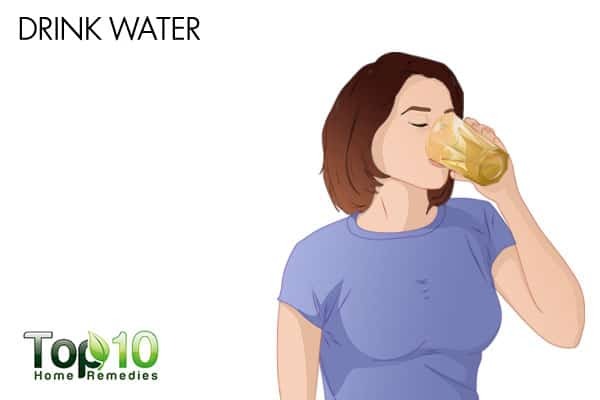 Drink at least 8 to 10 glasses of water per day. You’ll know that your body is well-hydrated if your urine is clear. To increase your water intake, you do not have to stick to just plain water. Slice up some lemons or other citrus fruits and add it to the water for a mild flavor. 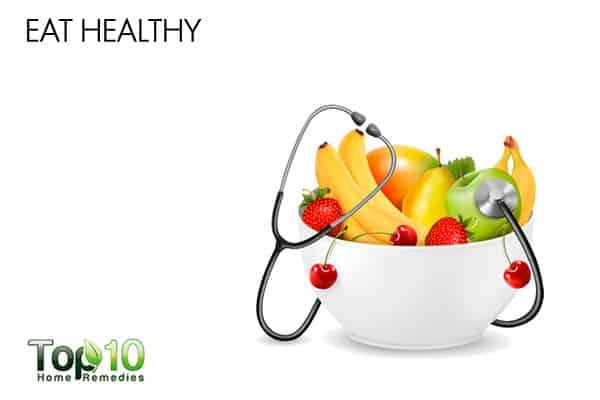 In addition, fruits and vegetables rich in water content help a lot in keeping your body hydrated. Other options include drinking green tea, milk and warm winter beverages like hot chocolate. If needed, you can try an over-the-counter allergy medication, but it is always best to consult your doctor first. To treat the itchiness, you can use a topical cream like calamine lotion. A cold compress can also soothe itchy, inflamed patches of skin. No matter what, you should avoid scratching your skin. It will only irritate the area and may break the skin. Dab saltwater on eczema to help kill any bacteria that may be growing on the irritated or broken skin. Wash your clothes and linens with a detergent that is specifically designed for sensitive skin, free of dyes and perfumes. Get plenty of sleep and control your stress to limit cortisol production. A high cortisol level in the body can lead to excess inflammation that worsens eczema. I suffer from chronic eczema and I’ve tried many different things over the years for the itch. There’s an oil that works great and smells great. It’s peppermint oil. Dilute some in a large salad bowl’s worth of water, soak it up into a cloth and apply the cloth to the affected area. Let it sit there for anywhere from 5-30 minutes, periodically soaking up more peppermint oil solution. It feels a little cool, then hot; a very nice calming sensation. On a real bad outbreak I did this morning and evening til the rash cleared up.